Exclusive tour with maximum 15 people per week. 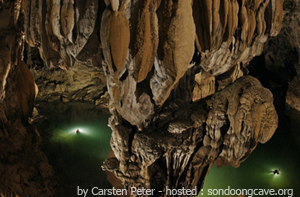 Son Doong cave is world’s largest cave, located in Son Trach, Bo Trach District, Quang Binh province, Vietnam. 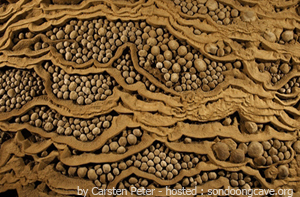 It is found by a local man named Ho Khanh in 1991 and was recently discovered in 2009 by British cavers, led by Howard Limbert. 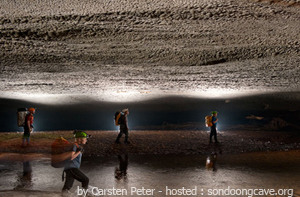 The name “Son Doong” cave means “mountain river cave”, It was created 2-5 million years ago by river water eroding away the limestone underneath the mountain Where the limestone was weak, the ceiling collapsed creating huge skylights. 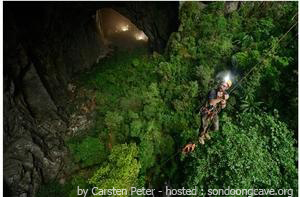 Son Doong cave is more than 200 meters wide, 150 meters high, and approx 9 kilometers long, with caverns big enough to fit an entire city street inside them, twice as large as Deer Cave in Malaysia (currently considered the world’s largest with 90 meters wide, 100 meters high and 2 kilometers long). 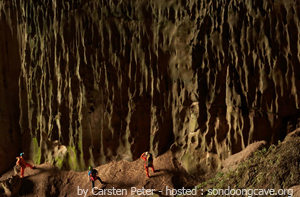 Son Doong cave was classified as the largest cave in the world by BCRA (British Cave Research Association) and selected as one of the most beautiful in the globe by the BBC news.